When launching a bees control program , it is essential that you know the species that you are confronting.. Each has its own habits and traits that can alter your approach and treatment plan. Carpenter bees are large bees, resembling bumblebees. They are heavy-bodied and metallic blue-black with green or purplish highlights. The bodies are covered with bright yellow or orange hairs. The males and females cut a one-half inch circular hole into the wood, then create a tunnel parallel to the surface of the wood. Within the tunnel the female stores food and lays eggs. 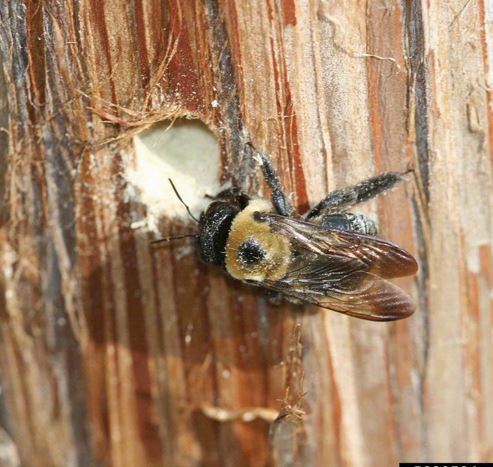 The developing carpenter bee larvae are in individual cells in the tunnel. There is usually only one generation per year. Cut holes in wood; yellow sawdust containing waste materials leaves unsightly stains. Spraying the entrance hole with an aerosol insecticide and plugging it with wood putty to prevent adults from returning can achieve control of these insects. Females are quite docile, although they can sting. Males are aggressive, but cannot sting. 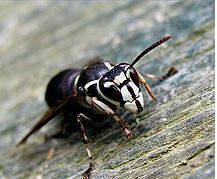 Dolichovespula maculata is a North American wasp commonly called the bald-faced hornet. The baldfaced hornet is a large, black and white hornet up to 1 inch (25.4mm) in length. It is black and white in color with a mostly white head or “face”. It is widely distributed in Virginia. The nests are constructed of the same paper-like material as that of other wasps (yellowjackets). They differ a great deal from other wasp nests in being enclosed in a thick “paper” envelope. There is a single opening at the lower end of the nest and a few hornets always guard this. Nests are always abandoned at the end of the season. The oval-shaped nests are often quite large and are usually found attached to limbs of trees. They will occasionally build nests in eaves, windows and have been found under decks and in crawl spaces. The workers are killed by frosts in the fall. The fertilized females (future queens) hibernate in barns, attics, and other sheltered places. The queen by herself starts the new nest in a new location in the spring. They have alternating black and yellow stripes and are not as hairy as bees. Their wings are a smoky color. Pest Control – Yellow Jackets Can Be A Serious Nuisance.